The Canadians arrived in Bexhill on 12 March 1917 following the relocation of the Canadian Training School (CTS) from Crowborough. The CTS was joined by the Canadian Trench Warfare School (CTWS) in May of the same year. In January 1918, the Canadians took over Cooden Camp and converted it into Princess Patricia’s Canadian Red Cross Hospital. The Canadians took over many town centre buildings and locations. Egerton Park was the main training grounds of the CTS; land where St. Augustine’s Church now stands was where the CTWS laid trenches; Down Council School (now King Offa School) hosted CTWS lectures; and the Metropole Hotel was the main billets (a building where soldiers are temporarily lodged). The Sackville Hotel, The Pelham Hotel, the Kursaal, and Bexhill Museum were used for socialising and entertaining. The Canadian presence in the town was extensive. The CTS band played regularly in Egerton Park and Canadian social clubs were opened in the town. The Soldiers Club, informally called ‘Ye Old Trench Club’ was opened in May 1917 at 18 Sackville Road, Bexhill. 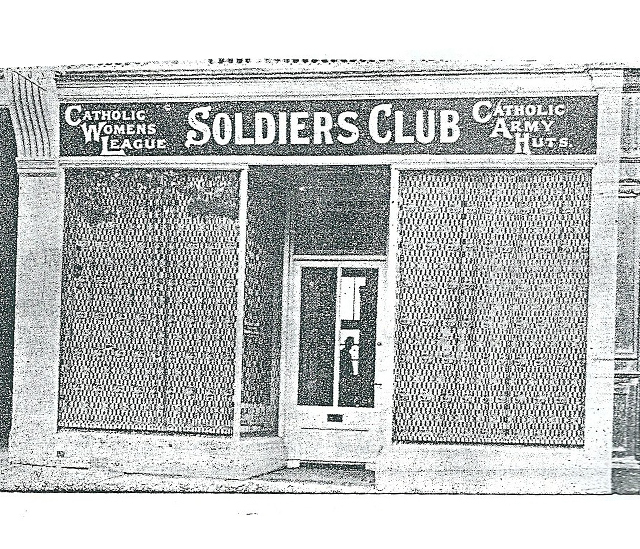 The club was funded by the Catholic Army Huts committee of the Knights of Columbus, a fraternal Catholic organisation, and run by the local Catholic Women’s League.